As I write, it's 95 degrees Fahrenheit/35 degrees Celsius in Seattle. On scorchers, I usually opt for colognes they make me feel refreshed and clean. Apparently, most of my citrus scents are too hot to work today (even 10 sprays result in only minutes of refreshment). I don't want any "sugar" in my perfume on hot days, and cumin and grapefruit are risky ("That man needs a shower!") And I'm not interested at all in the army of white musk-infused citrus scents on the market that remain on skin till Kingdom Come; the last thing I want today is to be reminded of a steamy laundromat. My hot-weather choice? I often opt for a vetiver-focused perfume; vetiver makes me feel clean and "cool." Too bad my latest vetiver purchase (Etro Vetiver) is a failure in this oven-like heat; it disappears from my skin in under 10 minutes. 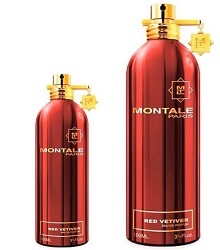 So, thinking of that old phrase — "fight fire with fire" — I turned to a new vetiver fragrance: Montale Red Vetiver1. Red Vetiver begins with a vibrant pepper-and-vetiver combo: torrid pepper (black and red) says "Meh!" to Seattle heat: "I've experienced worse...Egypt anyone?" Vetiver does not stand alone for very long against the sizzling pepper onslaught; it's joined by cooling "turpentine" made with grapefruit peels (not "sweaty" smelling at all) and — SURPRISE! 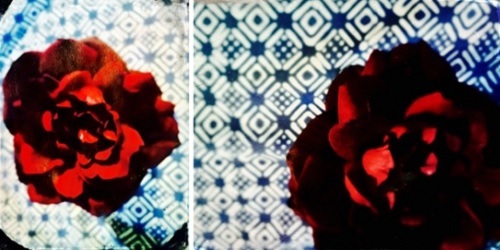 — an incense-y red rose. I don't know if this "rose" IS rose or the result of a brilliant fragrance note mix, but the rose note is fat and happy. As the rose fades, beautiful cedar (let's call it red cedar) appears. This cedar note is soft and talc-y (and talc makes me feel cool, too). Red Vetiver joined my to-buy list the moment I smelled it (too bad I have to wait till autumn...I don't want my bottle broiled en route from L.A. or New York). If you love vetiver with a twist, give Red Vetiver a sniff. Even a dab of it on one finger outdid Etro Vetiver sprayed over my arms and chest. Impressive. What scents cool you off when the atmosphere shimmers in desert-like heat? Montale Red Vetiver Eau de Parfum is $120 (50 ml) or $170 (100 ml). For buying information, see the listing for Montale under Perfume Houses. 1. Listed notes of vetiver, cedar, patchouli, grapefruit, elemi, black pepper. Note: top images by the author. Carner Barcelona D600 also does pretty well – it also features vetiver but of a softer kind. And it has iris which I love 365 days a year! Lucasai, I think I may have an unsniffed sample of that…will look for it! Wow, Kevin! You make the Red Vetiver sound like a must-sample. I’m afraid it has joined the ever-growing list! Sounds lovely. My favorite for a chic heat beat is Hermes’s Paprika Brasil. It practically reflects the heat with that pepper note, followed by a cool iris. It doesn’t get a lot of love but it sure does last all day. I’m about to need another bottle. I’d love to try this. I love pepper accords, even the much maligned pink pepper. Coumarin…I enjoy pepper, too. Ashamed I have not sniffed Paprika Brasil ! Will walk to Nordstrom to try it. Kanuka…thankfully it’s cooled off here too…but not THAT MUCH, HA! Me too, PB is a great hot weather choice. I also wear the smoky vetiver Etro Palais Jamais, which is great in the heat. In our recent heatwave I was surprised that Ninfeo Mio fared very well indeed – the cool figleaf lasted all day. Vetiver is wonderful on hot days, totally agree. I wear a lot of Dia Man during summer, and would love to own a bottle of either the Guerlain or Sycomore as well. Will surely try this Montale if I have a chance. Their Vetiver des Sables is nice, too. Kevin, I love vetiver in the heat, too. My top scents for broiling weather are Anat Fritz and vintage Caleche. Different animals completely, but they both have that “dry” quality to me and wear well during hot weather. I will have to try those vetivers from Montale. You make the Red sound delicious, and I can’t believe I’ve never tried Vetiver des Sables! Oddly enough, really hot, humid days in northern Virginia are the only times I like to wear Prada Infusion d’Iris. I usually find it boring but I don’t want anything stimulating when I’m hot, and infusion d’Iris is very chill. It’s practically indestructable, too. Notes: ginger leaves, pepper wood, raw cedar, black cardamom, candied ginger, and benzoin resin. It might be too soft for you, but I was intrigued. Ooh, I love vetiver, rose, and incense This sounds like it should go on my to-buy list! Thanks for a great review, I normally overlook Montale because I find the bottles very ugly (yes, I know that is a silly reason, but I have to narrow down the list of things to try somehow!). Yukiej, I know…I’m not a fan of metal bottles either. This sounds so lovely in the heat of summer Kevin. I don’t often buy samples these days, rather put the money towards a full bottle, but I may make an exception for this one! I love Epic woman in hot weather too, also peppery herbal, incense rose. Iris, Tonka bean, amber, oak moss.. I’ve really fallen for it, I love it in the heat, and find it refreshing, but you may find it better in the Autumn, I can’t wait to try it in cooler weather! Thanks for the gr8 review. mayfly: thanks for the recommendation on the MH…have not sampled it! I thought Montale had another scent called Red Vetyver that was a dead ringer for Terre d’Hermès… don’t have it with me right now to check. Interesting that they would release another one with nearly the same name. cazaubon: maybe they just changed the spelling of vetiver? The notes sound the same to me. I love vetivers in any weather. For hot weather I like Geraniamum Pour Monsieur. I keep a bottle of Guerlain’s Imperiale in my fridge for the hottest days. Spray it on. Let it evaporate. Repeat every two hours. Dilana: Imperiale is an every-day thing for me too…never tried it in the fridge. I like Red Vetyver, but I like Terre d’Hermes a bit more. Montale is more tenacious, though. It has a metallic feel on me which makes it more synthetic and it’s sweeter than TdH. In the heat? Well, Vetiver by Dior and Sycomore by Chanel were surprisingly good in hot weather. I do like Grey Vetiver and Sel de Vetiver a lot in the heat too. Sebastian: I’ll have to compare them side by side, Red Vetiver didn’t bring Terre d’Hermes to mind, but it’s been ages since I wore it. I don’t notice faux wood in Red Vetiver as I do in Terre…all that Iso E Super. Red Vetiver is now on my must-sniff list – thanks! My favorite cool-down scent this summer is the gorgeously verdant new Shi_sõ from Nomenclature. Yep when I smelled this it smelled *just like* Terre d’Hermes. Mike, for once I choose Montale over my beloved Hermes…unheard of ! Ha. Just got a chance to test this scent and so glad to find your review! I did not bother testing it before because the Montale line is sooo huge and I already had Td’H. Though I bought the Hermes thinking I would live in it (so versatile) I ended up finding it too masculine for comfort and gave it to my brother. (I actually wear plenty masculine scents so not sure why this one felt off kilter. In any case – happened to spritz this on and am loving it. Going from memory (which can be misleading) I would say that this does not have the transparent-mineral tone of TdH. It’s sparkle comes from pepper while TdH had a slight saltiness (not so much as Grey Vetiver or TDC’s Sel de Vetiver had). TdH made me think of sun-baked boulders at the beach. Delicately sweet and warm and with the texture of a visual mirage resulting from sunlight on water. I think I’m busy rationalising a purchase ??? ?